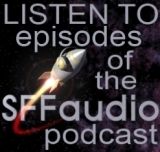 The SFFaudio Podcast #068 – Scott and Jesse talk about recently arrived audiobooks. Recent arrivals, Penguin Audio, The Books Of Elsewhere: The Shadows by Jacqueline West, The Lion, The Witch, And The Wardrobe, TheBooksOfElsewhere.com, inherited books, The Green Knowe series, kids love series, Nelson DeMille’s The Lion, Lion’s Game, Collected Fictions by Jorge Luis Borges, The Gospel According To Mark by Jorge Luis Borges, Gene Wolfe, George Guidall, Anne McCaffery’s Dragonriders Of Pern: Dragon Girl by Todd McCaffrey, Mexico, Mexico City, “turista”, Dragonflight by Anne McCaffrey, the thread threat, the Honor Harrington series, Mission Of Honor by David Weber, Paul W. Campbell, On Basilisk Station by David Weber |READ OUR REVIEW|, Lois McMaster Bujold, Full Cast Audio, The Unicorn Chronicles: Book 4: The Last Hunt by Bruce Coville, Doctor Proctor’s Fart Powder by Jo Nesbo, Mobile Infantry vs. the immobile infantry, re-write Starship Troopers as Warehouse Troopers, Water Steps by A. LaFaye, Sense And Sensibility And Sea Monsters for kids, Spaceship Rat, baby rat trauma, capybara, Brilliance Audio, The Deed Of Paksenarrion: Book 2: Divided Allegiance by Elizabeth Moon, The Sad Tale Of The Brothers Grossbart by Jesse Bulington, The Vampire Earth: Valentine’s Rising by E.E. Knight, space vampires, Graphic Audio, The Immortals: Book 4: The Realms Of The Gods by Tamora Peirce, More Than Human by Theodore Sturgeon (read by Stefan Rudnicki and Harlan Ellison), gestalt, fix-up, Baby Is Three by Theodore Sturgeon, Caedmon, H.G. Wells, Microcosmic God by Theodore Sturgeon, Falling Free by Lois McMaster Bujold (read by Grover Gardner), The Reader’s Chair, Falling Free by Lois McMaster Bujold |READ OUR REVIEW|, Paul Is Undead by Alan Goldsher (as read by Simon Vance), zombies, has the public domain classics remixed with supernatural horror jumped the shark?, A Picture Of Dorian’s Gray, Quirk Books, “paranormal romance has got completely out of hand”, Dark Shadows, soap operas, Soap, M*A*S*H, Three’s Company, Bosom Buddies, Blackstone Audio, the Newford series, Widdershins by Charles De Lint, urban fantasy alert, Mindswap by Robert Sheckley, Tom Weiner, Altered Carbon, A Galaxy Trilogy: Volume 3, Giants Of Eternity by Manly Wade Wellman, The War Of The Worlds, “standing on the shoulder of giants”, The Girls With Games Of Blood by Alex Bledsoe, The Return: Book IV of Voyagers by Ben Bova, “sensawunda”, first contact, the Grand Tour series, the Asteroid Wars series, the 2006 Harlan Ellison interview, City Of Darkness by Ben Bova |READ OUR REVIEW|, Neil Gaiman, Around The World In Eighty Days by Jules Verne (as read by Jim Dale), Douglas Adams, The Hitchhiker’s Guide To The Galaxy: Live In Concert, Footfall by Larry Niven by Jerry Pournelle, Audible Frontiers, Police Your Planet by Lester Del Rey, Lest Darkness Fall by L. Sprague de Camp, The Sword Of Shannara, The Elfstones Of Shannara, Neal Stephenson, Anathem, Boneshaker, The City And The City, Julian Comstock by Robert Charles Wilson |READ OUR REVIEW|, Palimpsest, WWW: Wake, The Windup Girl, ebooks, Fictionwise, PaperbackDigital, Kelli Stanley, The Functional Nerds Podcast interview of Mike Resnick, Pump Six and Other Stories by Paulo Bacigalupi, The Alchemist And The Executioness by Tobias S. Buckell and Paulo Bacigalupi, Scott’s Pick Of The Week: Despicable Me, Jesse’s Pick Of The Week: Police Your Planet by Lester Del Rey, Zombie Astronaut, The Frequency Of Fear, The Frequency Lite. The audio versions are first-rate. Hanson and Cowan read the books with enthusiasm, providing different characters with different inflections. Great care was taken to make these novels a listening pleasure. Upon listening to this Nebula-winning novel, and after hearing I have no clue how many audiobooks since, I can still say that the Reader’s Chair titles are amongst the finest out there. Michael Hanson has a deep sonorous voice that demands attention, and Carol Cowan is a warm yet feisty counterbalance. 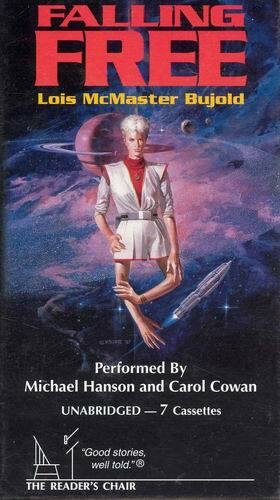 Falling Free is a novel that fits into Lois McMaster Bujold’s Vorkosigan series, but the events occur 200 years before the birth of the famous Miles Vorkosigan. The story involves a corporation that genetically engineers a new race of humans (called Quaddies) that are uniquely adapted for work in zero-gravity. Enter Leo Graf, an engineer hired to teach zero-g welding techniques to this new race of slave labor. When he sees how the Quaddies are treated, he becomes very uneasy. Think you know where this is heading? Bujold pulls it off brilliantly. This one is now officially out of print, but well worth finding. The Reader’s Chair productions are top notch, from the high quality production value to the sturdy and fine-looking packaging. I’m very sorry to see them go. Wikipedia defines Space Opera as “a subgenre of science fiction that emphasizes romantic adventure, faster-than-light travel and space battles where the main storyline is interstellar conflict.” A fair definition, I think. I also think that this definition of Space Opera is what most folks outside of science fiction fandom would accept as a definition of the whole genre of science fiction. The perception is both well-earned and difficult to fight since nearly every successful science fiction film and television series fits that definition of Space Opera. I’ve expressed several times how I wish that perception wasn’t true, because I enjoy only so much of this kind of SF. I like my science fiction to have meat on the bones, and there is plenty of that around in written SF. Enough, in fact, that the average Space Opera doesn’t even have to be on the menu. Of course, there are the exceptions and Lois McMaster Bujold is one of them. She’s the author of the Vorkosigan series of novels – an extremely well-written series which proves that Space Opera can be done well. Falling Free is a Nebula-award winning novel in a series that has also picked three Hugos. The story, which takes place 200 years before the other books, involves a company that genetically engineers a new race of humans (Quaddies) that is uniquely adapted for work in zero-gravity. Enter Leo Graf, an engineer hired to teach zero-g welding techniques to this new race of slave labor. Think you know where this is heading? Bujold pulls it off brilliantly. The audio version of this book is another exception. It’s performed by two narrators – Michael Hanson and Carol Cowan. They swap narrating duties with changes in the story’s point of view – a technique I first heard in this audiobook and that I find very effective. The two narrators also perform some conversations together during the story, somewhat like an audio drama. This is something I have found to be extremely INeffective in other audiobooks I’ve heard since this one, but here I enjoyed their interplay and didn’t experience the jarring effect that I’ve felt in other books that have attempted the same technique.